A memory stick containing information on hundreds of police investigations has gone missing in Edinburgh. A search was launched after the loss was reported on 26 February - up to two months after it disappeared at Lothian and Borders Police's headquarters. 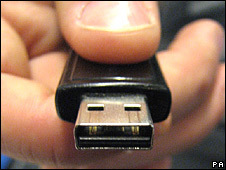 The USB memory stick contains 750 entries on vehicles "of interest" to police, along with other intelligence. Police said its loss did not compromise anyone involved in any ongoing or previous police investigations. It is understood the information on the stick was not encrypted as it was being transferred within a secure compound inside the force's headquarters in the Fettes area of the city. The memory stick, which was last used by staff working in the road policing division in the building, was lost between December 2008 and January this year. Lothian and Borders Police said that "exhaustive" inquiries were under way. A police spokesman said: "Lothian and Borders Police can confirm that it is unable to locate a USB memory stick. "We are taking this loss very seriously and have commissioned a review into how we hold and transport information within the organisation. "The reality of modern day policing is such that we exploit the latest technology. However, like every other large organisation, we have a responsibility to safeguard the information we hold." The spokesman added: "We are confident that this loss does not in any way compromise any individual involved in any ongoing or previous police investigations." Police said they would report the findings of the review to the information commissioner, who has been informed about the incident.